This is a rare Hart-Parr/Buhl Air compressor. With the design of a normal Hart-Parr engine, one of the cylinders was converted to pump air while the other provided power. We bought it from the estate of the late Mr. Donald Sell of Perryton, Texas. We are still doing research on this piece and any information is welcomed. We do know there were only 387 total units of five models manufactured; 55, 55c, 80, 90c and 180. 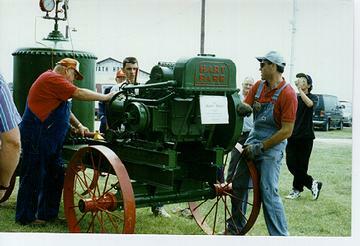 The completed outfit shown here was displayed first in 1996 at the Texas Early Day Engine and Tractor Association's annual show in Temple, Texas. Owned and operated by the Buice Family of Waco, Texas.